without the prior written consent of the Webmaster. 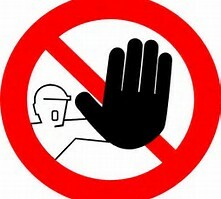 Webpage Are ALWAYS Welcome !! 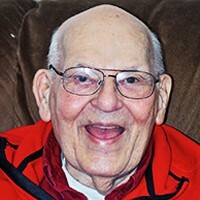 Donald Jerome Omodt, Age 89, a native of St. Paul and longtime resident of Southwest Minneapolis passed away peacefully on St. Patrick's Day. Don is preceded in death by his parents Hugh and Lillian; sister Marie; wife of more than 50 years Helen Ann; and daughter Debbie. 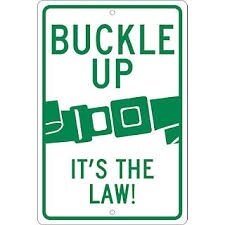 Survived by sister Nancy Krawczak of Mathomedi; sister-in-law Carole Kenny (Bill) of Bloomington; children Sue (Paul), Chris (Jane), Steven, Tom, Paul (Betsy), Amy (Molly) and Mark (Jane); grandchildren, David (Anna), Karin, Rachel, Matt (Sarah), Monica, Nick, Jake, Laura, Erin, Natalie, Kevin, Josh, Charlie and Luke; and many nieces and nephews. He also leaves behind his 'brother' Finn Aamodt of Oslo, Norway, who along with his wife, Astri, and their family were part of Don's vast extended family; Don is also preceded in death by his good friend and FBI partner Bill Geiermann, and friend and "fishing buddy" Mohammed (Mo) Selim. 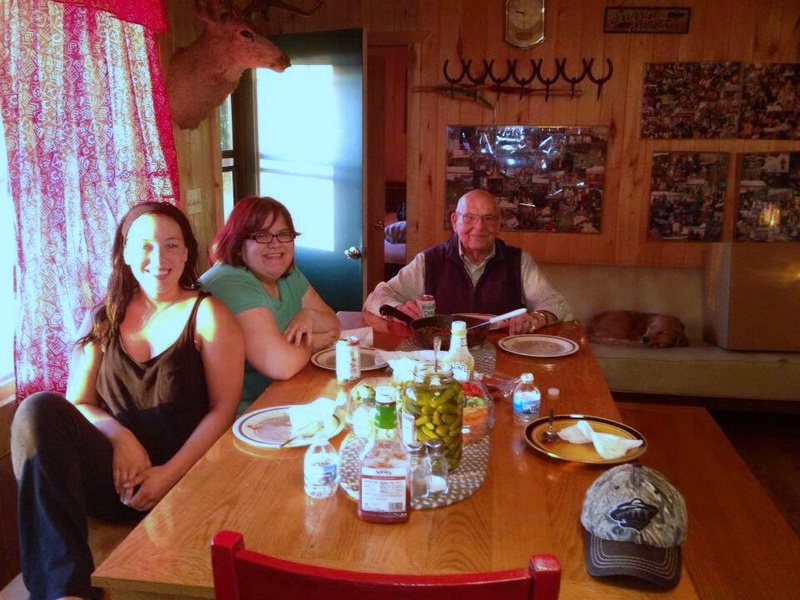 Don and his wife Helen Ann opened their house to many of people over the years and sharing a meal or spending a night at their home was their way of making the world a smaller place. Over the years, the Omodt home welcomed foster brothers and sisters, foreign exchange students, relatives, extended relatives and travelers. Special love to Sister Rosemary Hoschette, Sister Luke Hoschette, Duncan Wilson, Beth (Geiermann) Scott, the Aamodts of Norway, the Hervellas of Spain, Kathy Leuschner Trachsel of Switzerland, and Fernando Coelho of Uruguay who all became part of the fabric of Don's family. 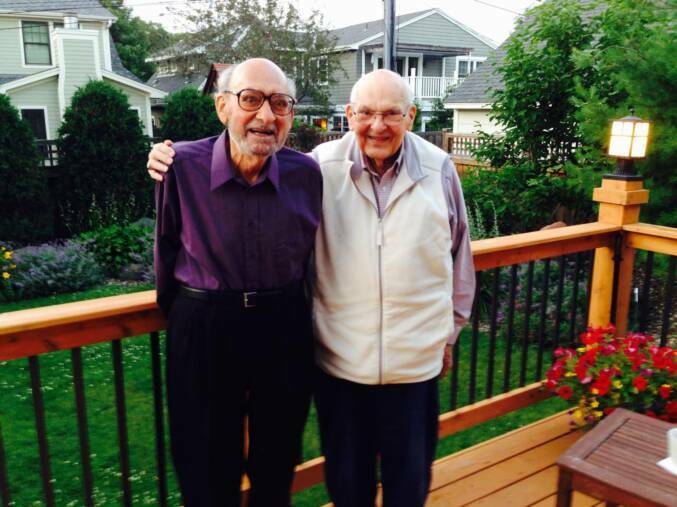 Don was a long-time public servant and active member of the Twin Cities community. 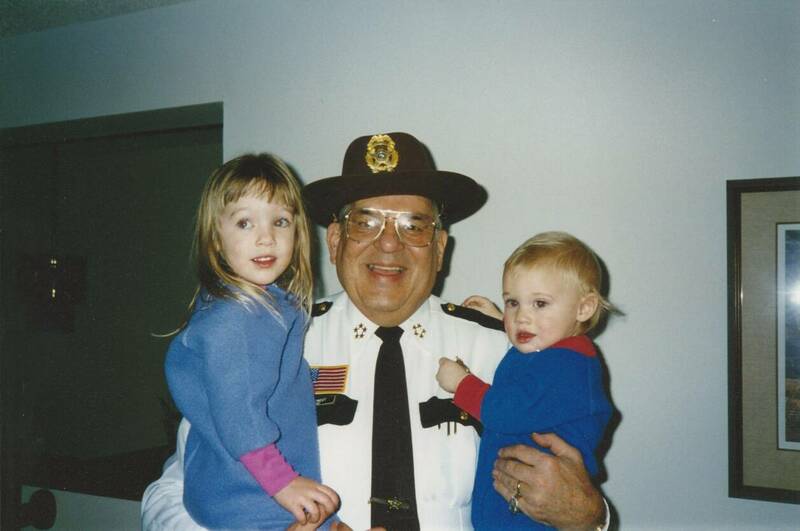 Don served as Hennepin County Sheriff for 28 years, shaping the Sheriffs Department to reflect the professionalism and pride of law enforcement "A public office is a public trust" guided his time as Sheriff as he sought to continually serve the County and law enforcement. 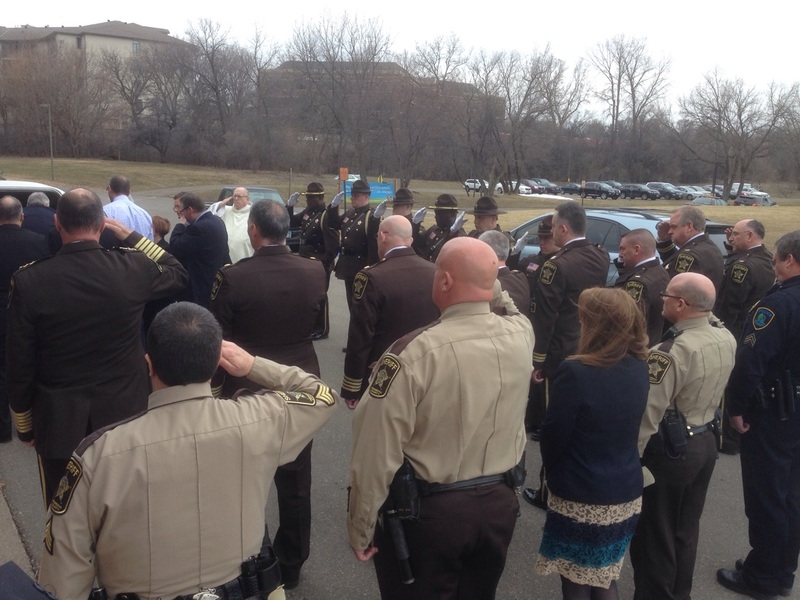 Special thanks to his Front Office leadership team and all the Hennepin County Sheriffs Deputies who granted him the privilege of his life to have proudly served alongside you. 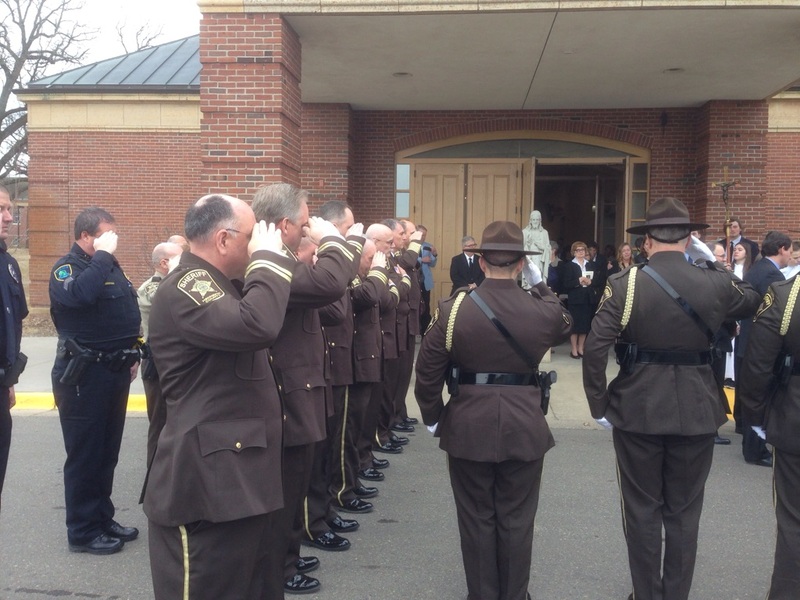 To his longtime Deputy Jim O'Shea who was like a son to Don, the family extends our love. His time in law enforcement also included time as assistant Hennepin County attorney and a special agent for the FBI for many years. Nationally, he served on the board of the National Sheriffs Association and as NSA president, as well as on several federal prison commissions. He taught Constitutional Law and police tactics for many years at Normandale Community College. 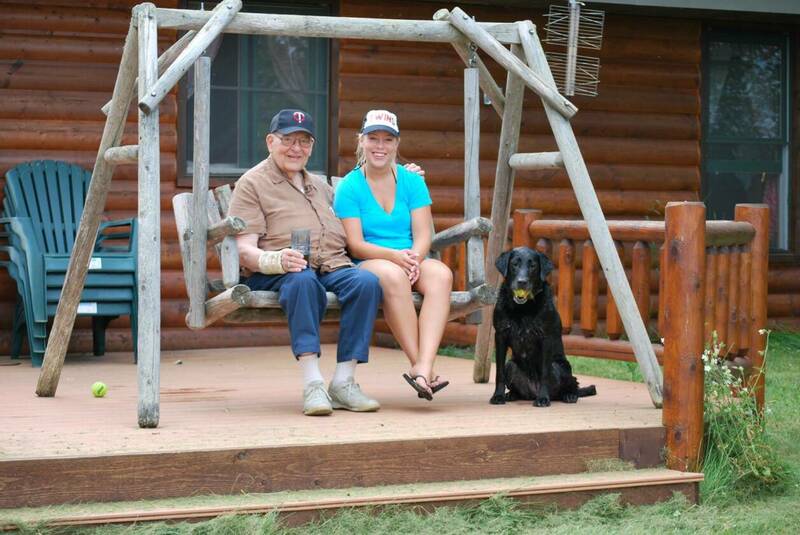 Don was a WWII and Korean War era veteran who trained as a U.S. Army paratrooper. 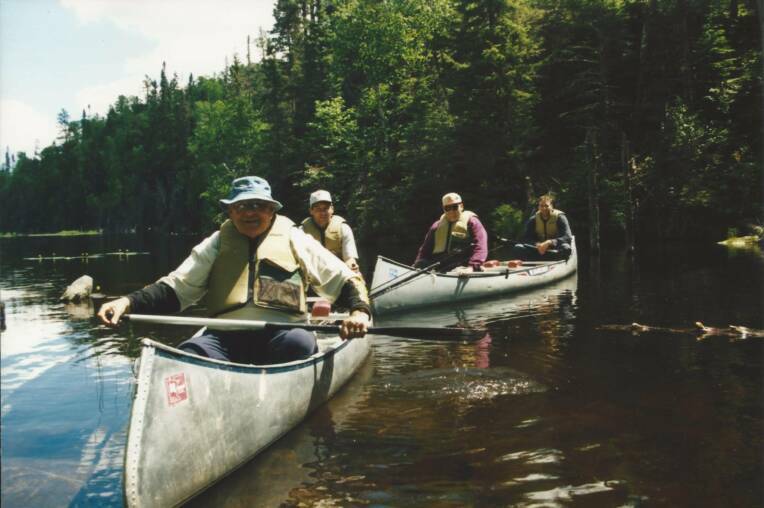 Don studied historic tilings that interested him and authored several books and articles over the years. Don is a proud graduate of Cretin High School (1945), the University of Minnesota, William Mitchell College of Law, where he received his doctorate of law, and the FBI National Academy. 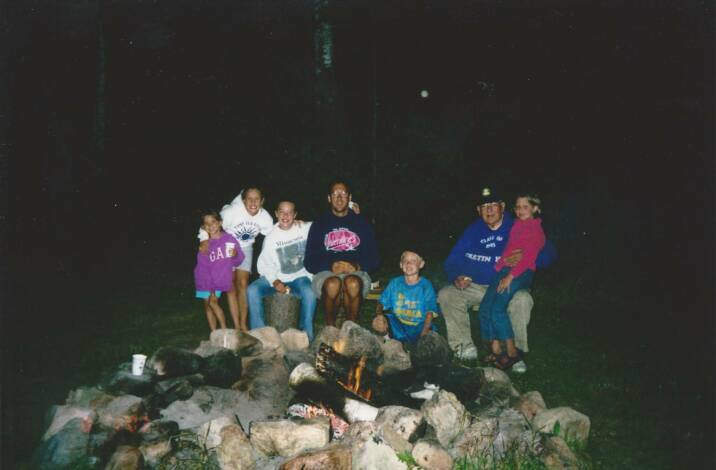 He loved playing, coaching and watching hockey as well as cheering on the Gopher Men and Women teams, North Stars and Wild. 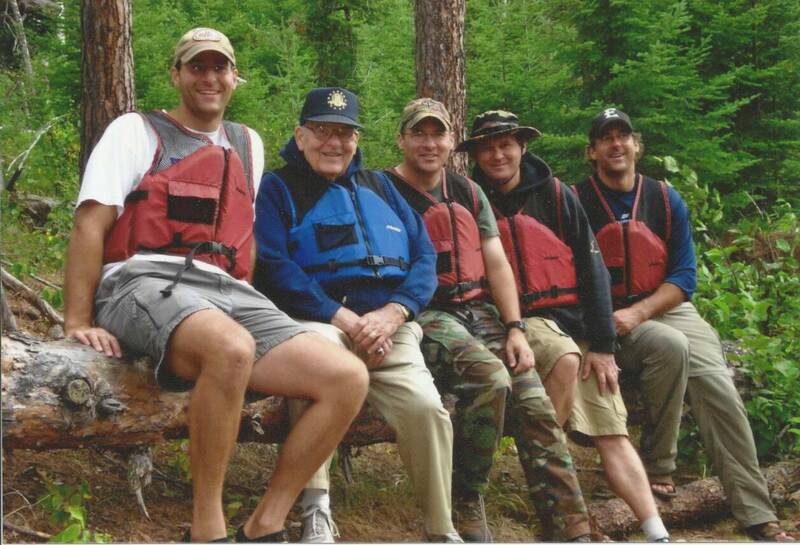 A man of great faith, love of family, and a believer in service to community and others, Don leaves behind a rich legacy born out by the many lives he touched. 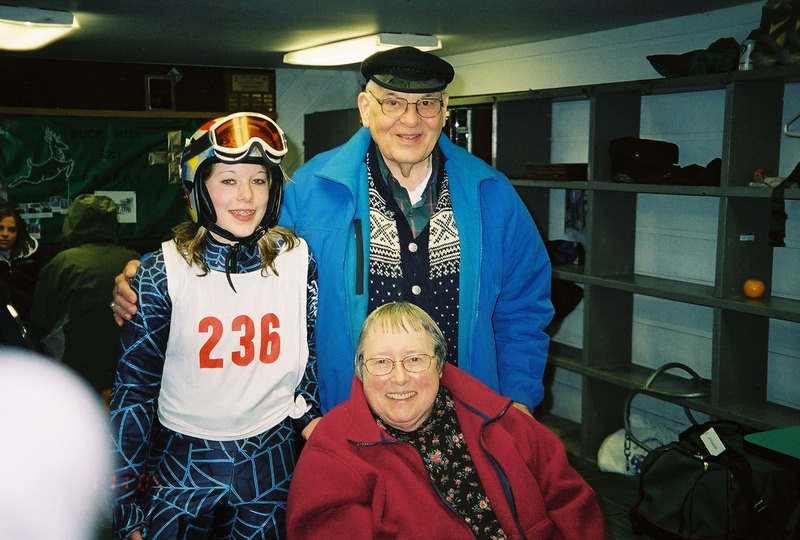 In lieu of flowers, memorials are preferred to Arc Greater Twin Cities, Vail Place, the Helen Ann Omodt scholarship fund at Southwest High School, the Cretin High School scholarship fund or donor's choice. 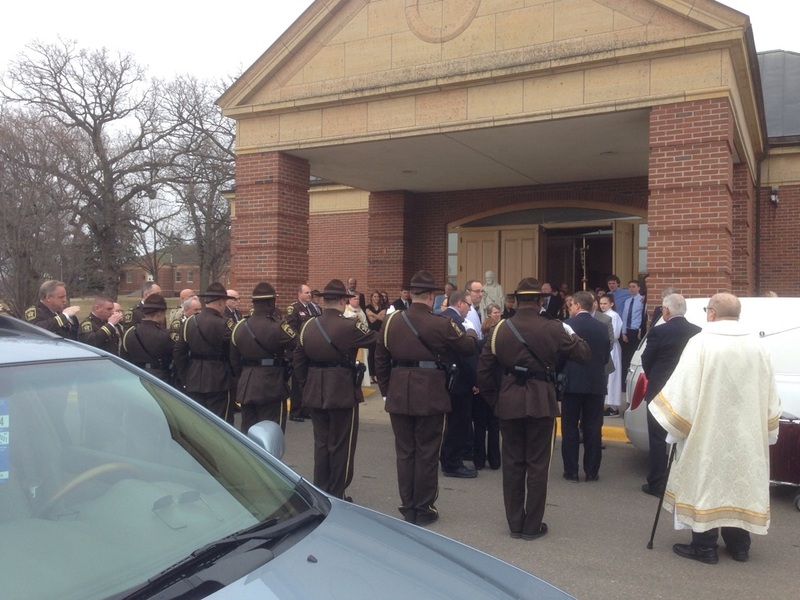 Mass of Christian Burial Thursday, March 23rd, 10:30 AM, Our Lady of Grace Catholic Church, 5071 Eden Ave., Edina. Interment Fort Snelling National Cemetery. Visitation one hour prior to service at the church and Wednesday, March 22nd from 5-9 PM at: Washburn-McReavy.com Edina Chapel 952-920-3996 West 50th Sreet & Highway 100. H.A.L.O. 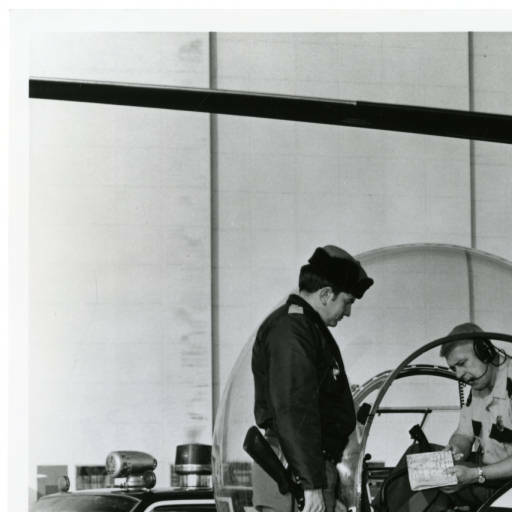 pilot Bud Phillips does his pre-flight checklist before taking off while Hennepin County Deputy Sheriff Jack Hacking looks on. 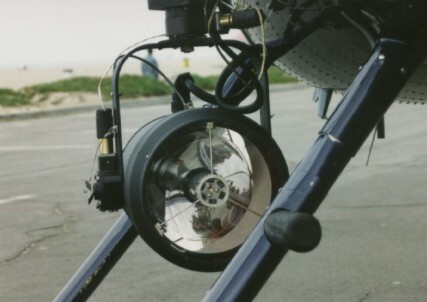 The helicopter also had a very high intensity light called 'Night Sun' that would illuminate large areas on the ground and was used for search and rescue or any other situation whre bright lighting from above was required. 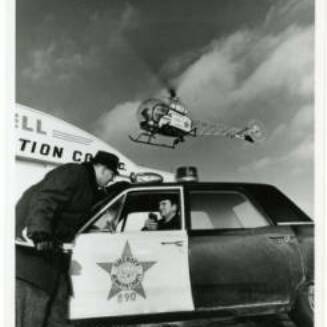 Sheriff Omodt was instrumental in getting the very first helicopter into service in Hennepin County. 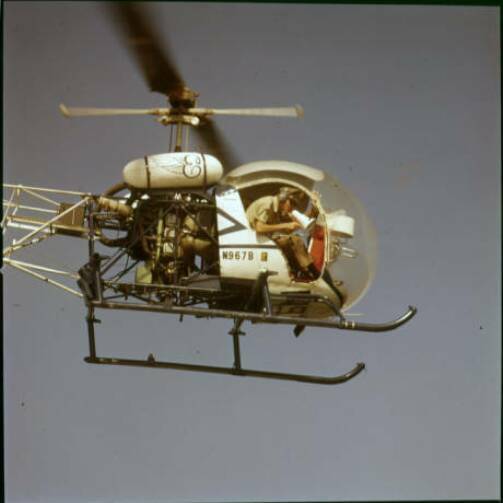 Hennepin County Deputies were assigned to fly in the Enstrom helicopter as 'observers' so that the pilot could concentrate on flying the machine. 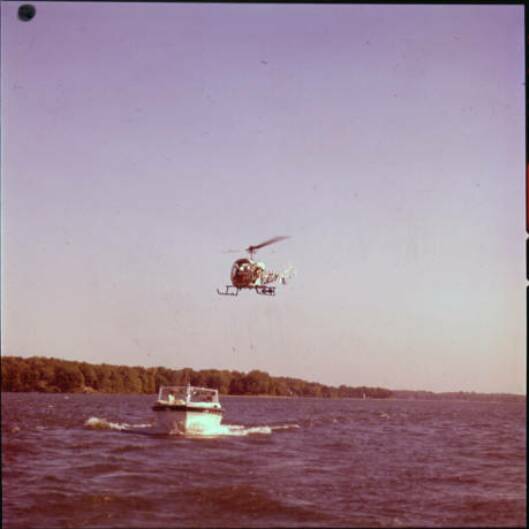 The helicopter was equipped with a fully functional two-way police radio that allowed the Deputy 'observers' to communicated with Police and Sheriff's personnel on the ground or, as in the case of the Hennepin County Sheriff's Water Patrol, on the water. The H.A.L.O. 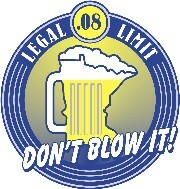 Project was coordinated by Hennepin County Deputy Sheriff's Curt Oberlander and Jack Hacking. 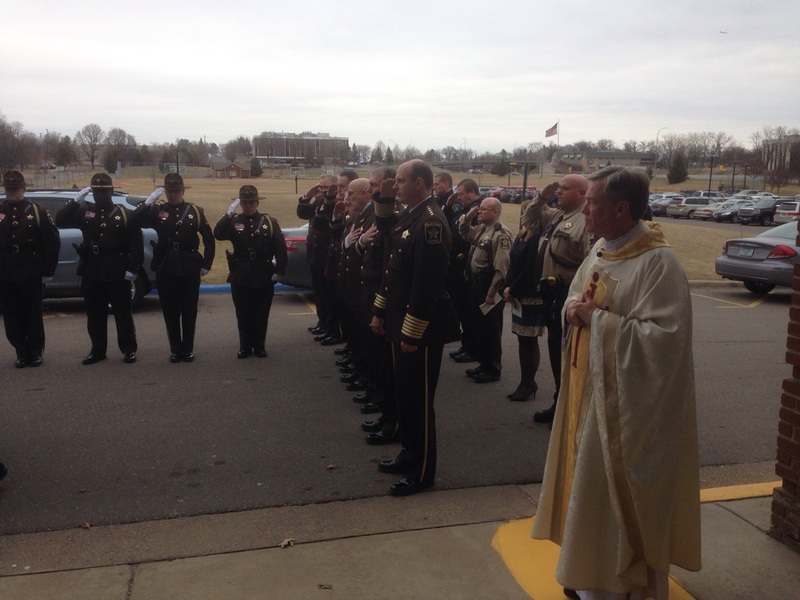 Sheriff Omodt Conducted An Annual Inspection Of His Deputies. 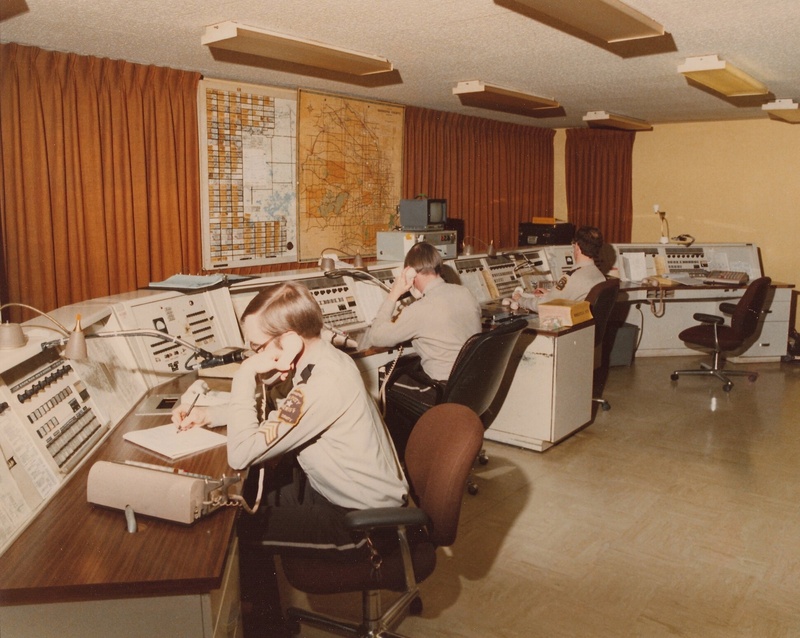 The Original Hennepin County Sheriff's Communications Center Located In Golden Valley Had Only Two Dispatch Positions And Operated On Only Two Radio Frequencies. 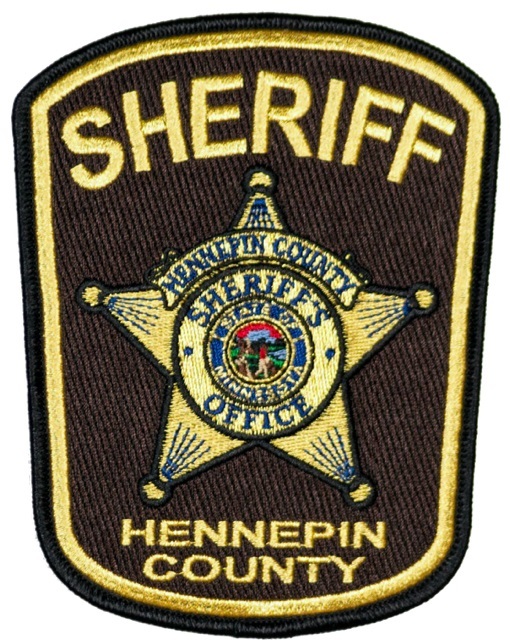 Sheriff's Vehicles And All Fire Apparatus Throughout Hennepin County. 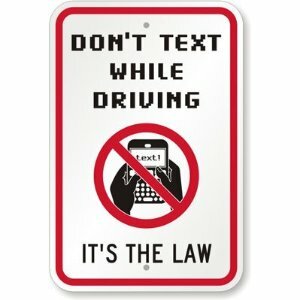 Important Information To Help Them Better Do Their Jobs. Existing 300 Foot Antenna Tower Was Replaced With A New 400 Foot Tower. 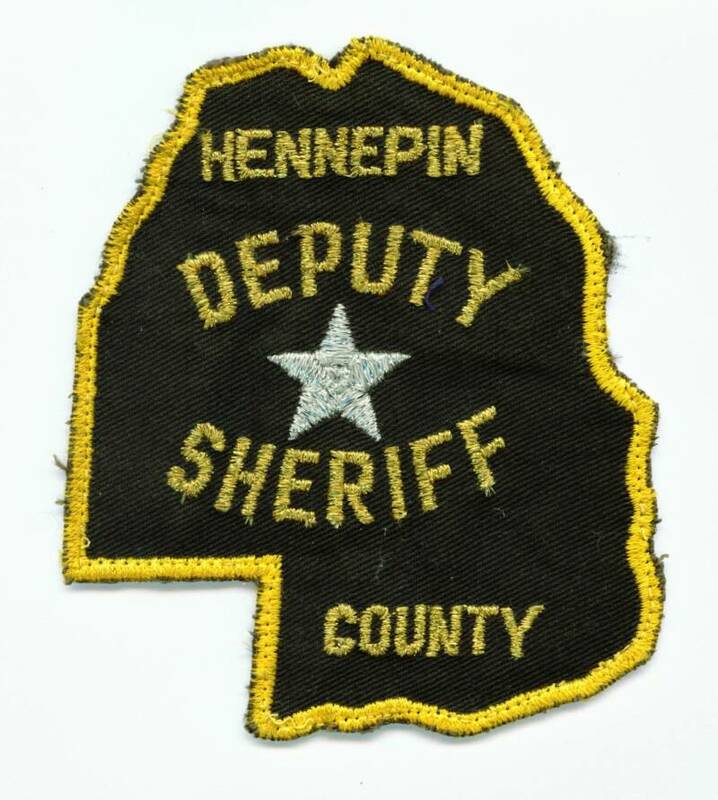 Office While Serving The Residents Of Hennepin County For Twenty-Eight Years. Appearing On My Internet Show To Talk About His Dad's Long And Impressive Career. Me And Sheriff Omodt Was Taken On February 18, 1976. 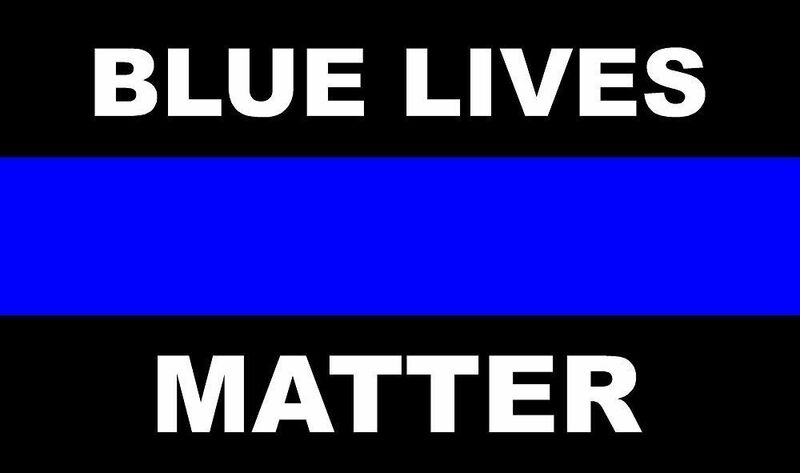 Leader In Effective, Progressive And Professional Law Enforcement. Twenty-Eight Years, Please Click On The Audio Control Below. 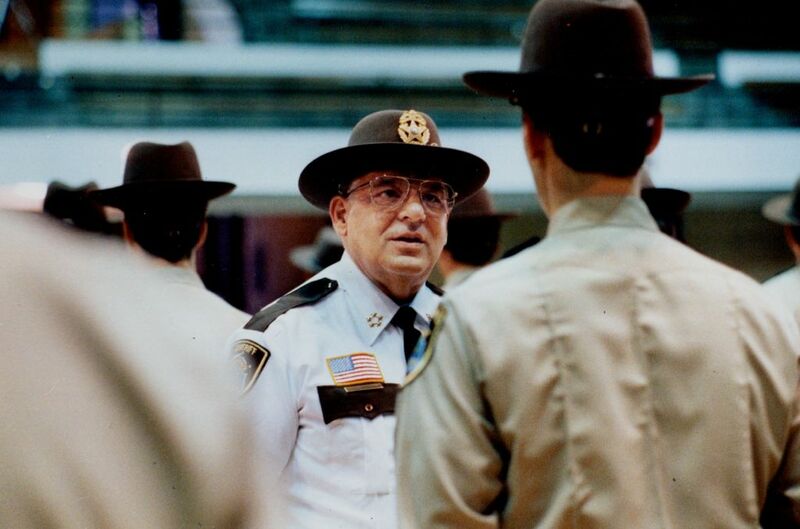 Donald J. Omodt, a native of St. Paul who most recently lived in Minneapolis, served as sheriff of the state’s most populous county for seven consecutive terms, from 1967 to 1994, according to the Sheriff’s Office. At age 66, he considered running for an eighth term, but changed his mind at the last minute, citing a desire to spend more time with his family. As the son of a St. Paul police detective, Omodt preached the importance of professionalism, and his rules sometimes earned him a reputation as a taskmaster among the rank and file. “I insist on excellence and expect excellence,” he said in 1993, shortly after announcing his retirement. The motto “A public office is a public trust” guided his time in that role, according to a tribute written by his family. 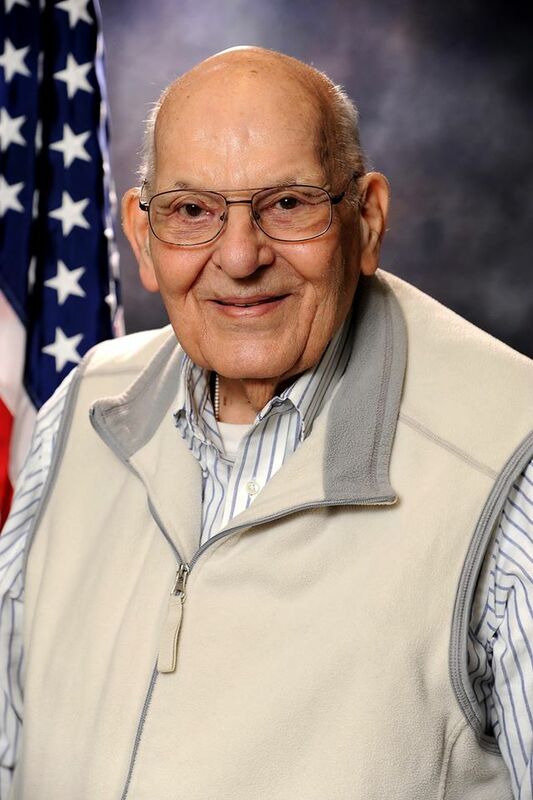 Before his career with the Sheriff’s Office, Omodt served as in the Airborne division of the U.S. Army during World War II and Korean War eras. 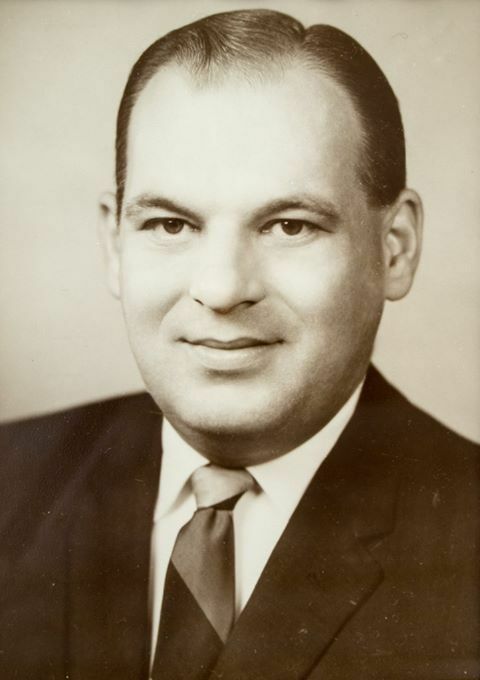 He worked as a special agent with the FBI and as an assistant Hennepin County attorney for seven years before running for sheriff in 1966. 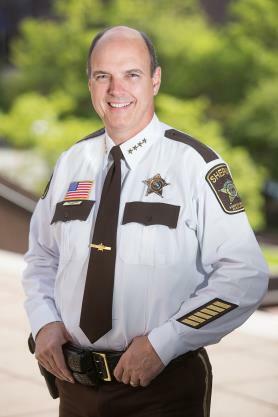 During his 28-year tenure as sheriff, Omodt was also elected president of the National Sheriff’s Association, the Minnesota State Sheriff’s Association, the Metropolitan Sheriff’s Association and even the Hennepin County Chiefs of Police Association. 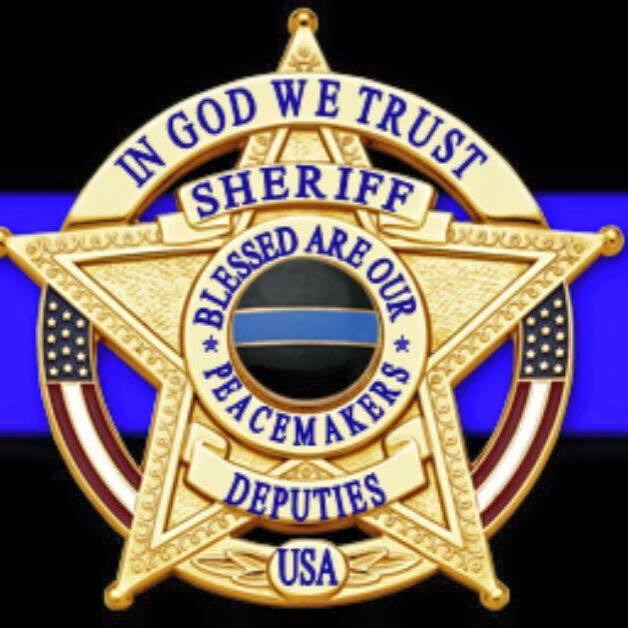 Many current employees of the Sheriff’s Office joined under his leadership, according to the department. At his retirement party at Minneapolis City Hall, Omodt was praised by staff members for aggressively adopting new technology to aid law enforcement, including computer-assisted dispatching and computerized photo-imaging of such records as mug shots. As a local history buff who wrote extensively about the state and county, Omodt occupied the vacant basement office area of City Hall to do research. Upon retirement, he worked to sort through nearly 100 boxes of sheriff-related files, some of which he planned to donate to historical archives. 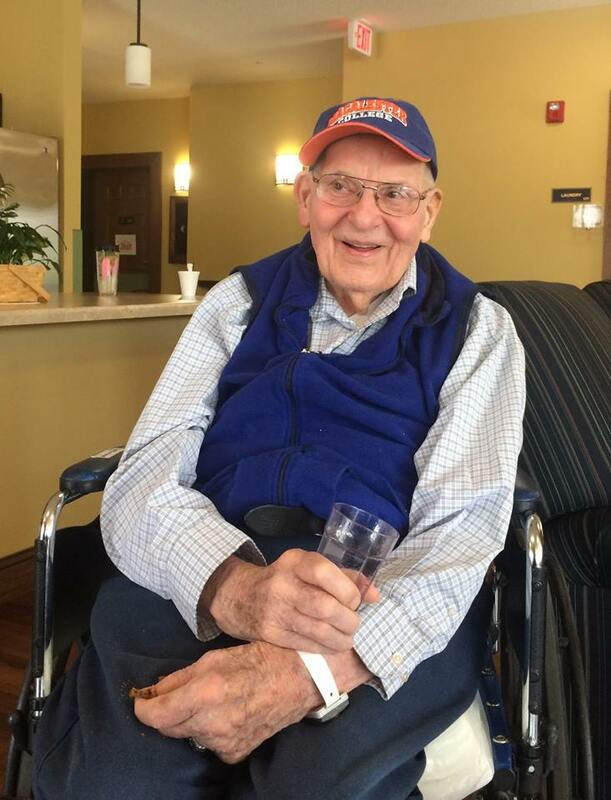 Raised a devout Catholic, Omodt graduated from St. Paul’s Cretin-Derham Hall in 1945 before attending the University of Minnesota. He earned his law degree at William Mitchell College of Law in St. Paul and completed training at the FBI National Academy. Sheriff Omodt taught constitutional law and police tactics at Normandale Community College, and according to his family, also quietly volunteered his time at area charities, helping found the ARC Greater Twin Cities to support people with developmental disabilities. He was also interested in family genealogy, serving proudly as a member of Torskeklubben, a club celebrating shared Norwegian heritage. 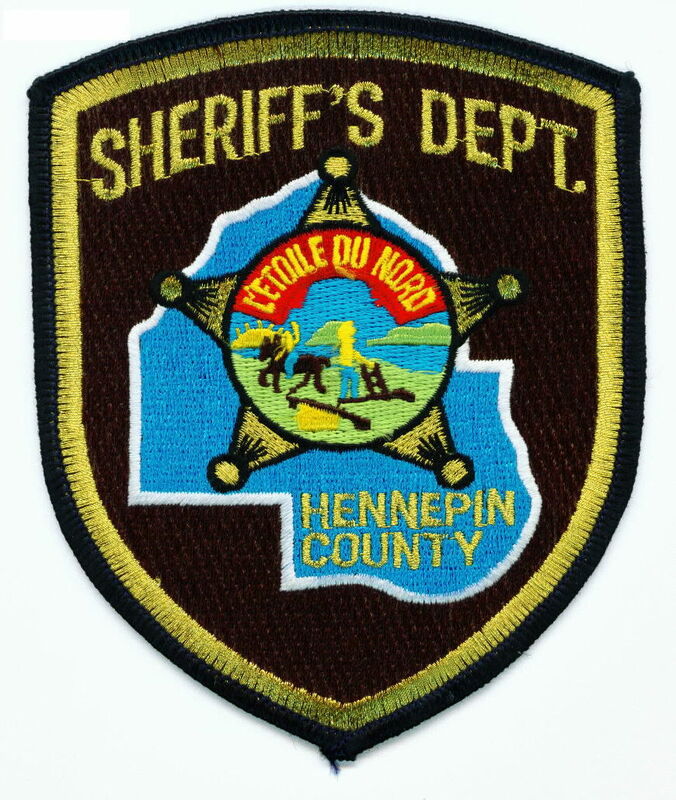 Sheriff Omodt and his wife, Helen Ann, were known for opening their south Minneapolis home to strangers, often welcoming foster children, foreign exchange students and travelers over the years, according to the obituary written by his family. He was preceded in death by his wife, who died in 2007, and a daughter, Debbie. He is survived by children Sue, Chris, Steven, Tom, Paul, Amy and Mark; his sister, Nancy Krawczak of Mahtomedi, and 14 grandchildren. 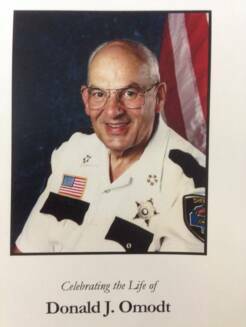 Sheriff Omodt Was Well Known For His Ever Present Smile And Positive Attitude Not Only To Those He Served, But Also To Those That Worked For/With Him. sons, Chris, Mark, Paul and Steven. 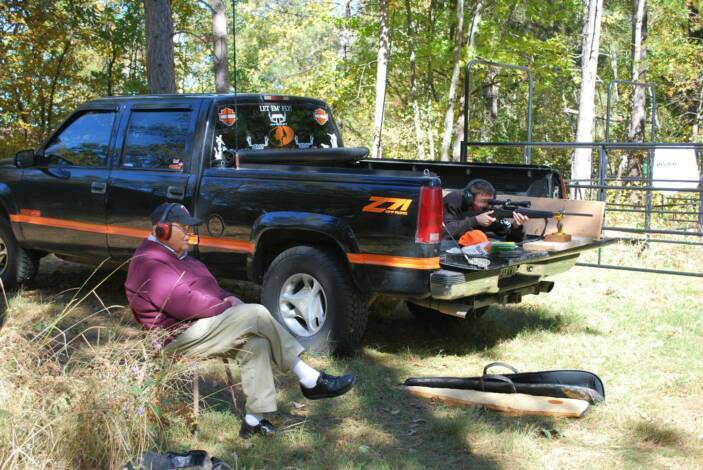 Matt sight in his deer rifle. and Matt, taken at the 'Erickson Cabin. If you work for a man, in heavens name work for him! If he pays you wages that supply you your bread and butter, work for him, speak well of him, think well of him, stand by him and stand by the institution he represents. I think if I worked for a man I would work for him. I would not work for him a part of the time, and the rest of the time work against him. 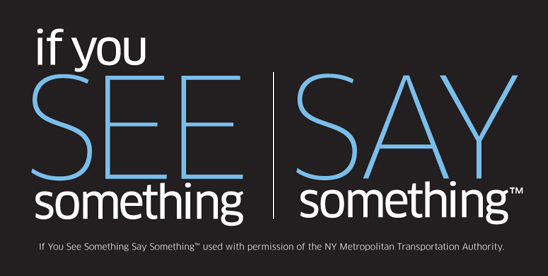 I would give an undivided service or none. If put to the pinch, an ounce of loyalty is worth a pound of cleverness. 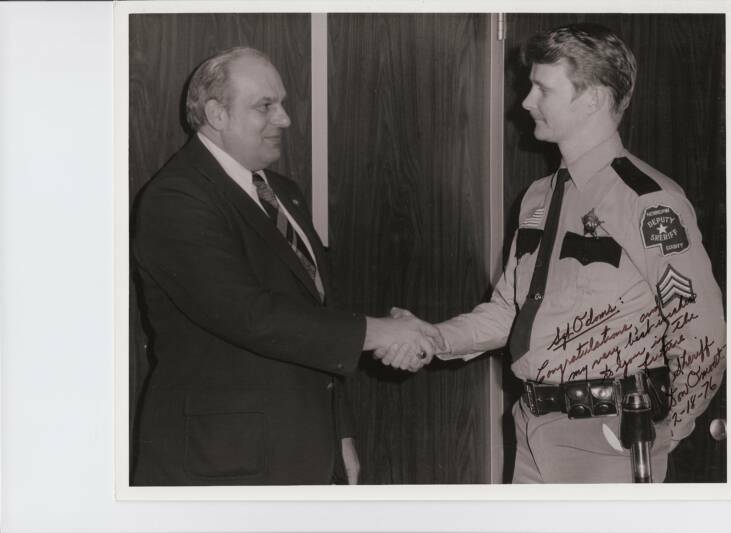 On March 18, 2019, I Sat Down With Chris Omodt,To Talk About The Many Accomplishments Of His Dad; The Longest Serving Hennepin County Sheriff In History And The Legeacy He Leaves Behind. To Hear This Second Interview, Please Click On The Audio Control Below. GOOGLE 'CHROME' BROWSER & Microsoft's 'EDGE', Cause All Of The Audio Files On My Websites To Play Instantly & Simultaneously. CLICK ON THE AUDIO CONTROL ICONS BELOW !! (Because Of The Size Of The Audio Files, It May Take Some Time For Them To Load Depending On Your Internet Speed).